If you like water, you cannot find a better place than Casa Nou del Lago to spend your holiday. Situated 10 steps up from the bank of the lake created by the Segre river, you do not only have the pleasure of relaxing by your private swimming pool, with a fantastic view over the lake and the mountains, you have also the possibility of going down to take a longer swim in the lake or perhaps relax with your fishing rod (we can help you buying a license). The house is built with a special permit given to those, who had a house flooded when the damn was built to regulate the water in the Segre River. Consequently, a lake arose where there used to be a small village. Casa Nou del Lago (The new house by the lake), is built in the traditional style, but with modern comforts such as TV and Wifi-internet connection. Also, the selected spot could hardly be better with the view and the access to the lake. Lay out of Casa Nou de Lago: The house has a very functional layout. On the ground floor, you have the open kitchen, sofa corner and dining area with dining table. There is direct access to the outdoor terrace, so it is easy to eat outside. There is also a fully equipped bathroom and the large bedroom with two bunk beds, where four persons can sleep. On the first floor, there are two very nice double rooms, one with double bed and one with individual beds (can be arranged as double bed as well), and a second bathroom. Outside, the terrace has a fantastic view to the pool area and to the lake. There is a nice garden around the house, and a stairway leads down to the bank of the lake. It is possible to swim in the lake and there is a raft 20 meters out. If you want to fish, it is also possible; you will just need to buy a permit. We can help. The house is perfect for those, who want to be in peaceful surroundings with no neighbours and with the nature providing the beautiful scenery around the house. Lisbeth and I (Bertel) are the owners of the company SYDENS FERIEHUSE. For the last 14 years we have engaged in letting out fantastic Catalan holiday homes, all of which live up to our criterias: they are authentic, charming homes and are all of a very high standard. 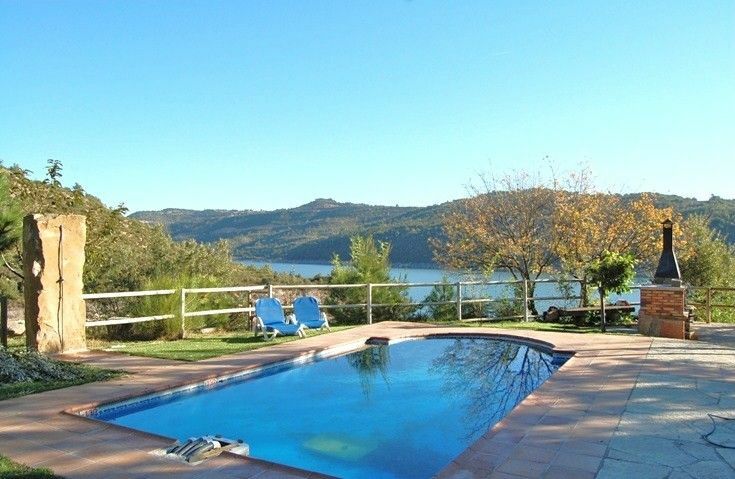 We now let out more than 400 beautiful holiday homes, and some of them are advertised on HomeAway - We help Julia and Josep let out Casa Nou del Lago. We consider the perfect holiday to consist of two parts - a nice holiday home and some great excursions and activities. For each part of Catalonia we have made an activity document with our personal recommendations. As we consider ourselves to be experts in Catalonia, you are of course always welcome to ask for help and advice. We aim to find the perfect holiday home for you. Das Domizil liegt traumhaft direkt am See, alles war sehr sauber und ordentlich, die spanischen Verwalter haben uns im Ort abgeholt und sich rührend gekümmert mit Begrüßungskuchen und Wein. Ein perfekter und gut gelaufener Aufenthalt, die Kinder hatten mit dem Pool ihren Heidenspass. Wer es etwas abgelegen mag, ist hier genau richtig. At the bank of a lake created by the Segre river, the house is situated with direct view over the lake and to the scenic scenery of beautiful mountains of the pre-pyrenees. You hardly find a more idyllic spot, and if you want to do some excercise, a local company offers Canooing, Kayaking, Rafting, Canoying. Still, it will be possible to visit Barcelona, Winedistricts, Andorra and many other things in day-excursions. Deposit: When booking the property, a deposit equal to 40% must be paid within 8 days to secure the booking. The price does not include: Catalan tourist tax: € 0,5/adult(+16)/night.